This month’s recipe was submitted by Divya Ashok of Divya’s diner. She is a fantastic professional Bake and cake designer. Our challenge is to make a fresh strawberry (or available fresh fruit based on location) cake with simple cake decoration you can use for your future use. 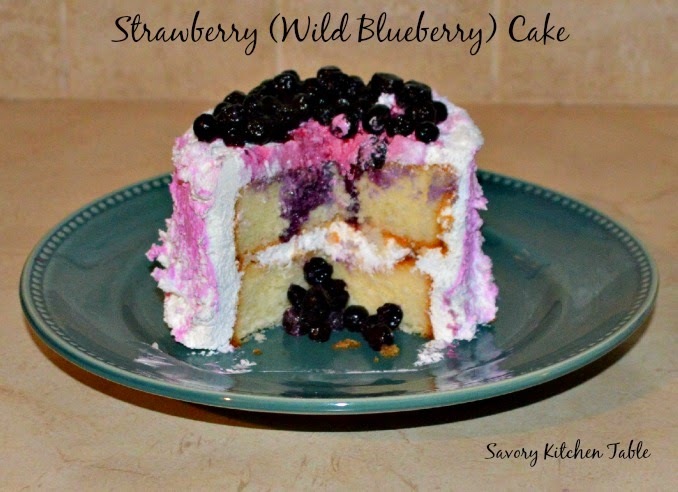 I used a small amount of strawberry flavoring in the icing and wild blueberries for the top. The spoon I used had once been the one in the garbage disposal (what you don't have one of those?) and it left the neat rough texture. Grease and dust two 8” pans. Cut butter into several pieces and allow to sit at room temperature. In a small bowl, whisk together ¼ cup of cooked strawberry puree and add ¼ cup of milk. Add vanilla extract and optional strawberry extract. Whisk in eggs, one at a time blending well. In a large mixing bowl, sift together cake flour, baking powder and salt. Mix it slowly in a stand mixer with paddle attachment or with a hand held mixer. Toss in softened butter pieces and continue mixing until you get a ‘bread crumb’ like texture. Slowly add the wet mixture gradually and the cake batter is ready. If you want the cake to look pink, add food dye. Pour batter equally into two prepared pans. The mixture will not be runny and it will be difficult to spread. DO NOT use spoon to spread it, instead drop the pans on the counter multiple times to level the batter. Bake it at 350 degrees for 25-30 minutes or until a toothpick inserted comes out clean. Once done, remove the pans from the oven and let it sit in the counter for 10 minutes. Cover it with plastic wrap and transfer it to the freezer for a night. Remove the cake from the freezer 4 hours before you start decorating and bring to room temperature. Wash and hull fresh ripe strawberries. Cut strawberries into small pieces and transfer to a bowl. Add a tablespoon of sugar and give a quick mix. Cover it and allow it to sit for 2-3 hours or even overnight in the refrigerator. Strawberries will become tender and juicy. Simmer the tender strawberries in a pan with ¼ cup of water for 20-25 mins over low flame, stirring frequently to prevent burning. Mash berries well and allow it to cool. When cool transfer the mashed berries to food processor with ¼ cup of water and puree until there are NO chunks left. Filter the puree if necessary to remove any chunky pieces. Take care not to leave any strawberry chunks! This would result in a mushy cake. In a large mixing bowl, add softened butter and mix it till it becomes creamy. Add sifted powdered sugar, heavy cream, salt and clear vanilla extract and mixing for several minutes. Trim cake top as necessary to level. Using a cake board, add a spoon of frosting in the center and spread it. Top it with a cake layer, trimmed edge facing down. Add a tablespoon of strawberry puree to ¼ cup of frosting, blending well. Use to fill between the cake layers. Spread evenly with a spatula. Add ½ cup of frosting on top and spread it evenly on the sides. Just make sure the cake is totally covered with frosting. This is called crumb coat. We are just locking up the crumbs of cake with the frosting. Let it sit in the refrigerator for 1 hour. Remove the cake from the refrigerator and add generous amount of frosting on top and sides. Spread the frosting. You do not need to have a smooth finish as we are going to have a unfinished look. Using a spoon with the rounded sided up slowly move on the sides from down to up, creating a pattern on the cake. Now do the same for cake top.